Goosebumps author R.L. Stine has now inspired a rave. Larry D. Moore CC BY-SA 3.0. If you were a literate child in the 90s, chances are you spent your evenings getting chills and thrills from author/visionary R.L. Stine’s obscenely popular Goosebumps books. With over 300 million copies sold worldwide, as well as numerous spin-offs, a television series and even Pogs, this Friday the fun of the franchise is back, in rave form. Yes, a Goosebumps-themed rave is going down this Friday at midnight at Tammany Hall with DJs Sandlot, Enji and The Magick Report. The first in a weekly series lasting all October that will include a costume contest, a ticket giveaway, and a different theme based on each book. We spoke to mastermind Sheila McNair, a Junior at NYU’s Gallatin School of Individualized Study, about putting the rave together and the reaction from R.L. Stine himself. Raver beware, you’re in for a scare! What was the genesis of bringing classic children’s literature and raves together at last? I wanted to put on a rave. It was actually an assignment in my Curating The Live Music Event class. You have to act as the booking agent securing the act, securing the venue, marketing, etc. I think raves are pretty relevant right now and I realized raves that have a theme tend to have more of a draw. I’ve been in my 90s nostalgia mode right now, like a lot of people my age are, and I wanted something all year round. I thought “Goosebumps? I love Goosebumps!” I have a remix of the theme song and I was listening to it and thought it sounds great. It’s the idea of playing off 90s nostalgia for kids in their 20s. And you’re having a costume contest. Yeah, we’re encouraging people to take a book cover or one of the episodes that they remember and dress like a memorable Goosebumps character like one of the ghosts or a werewolf or one of the Creeps, just anything they can remember. And we have tickets for Boys Noize as the prize for best costume. 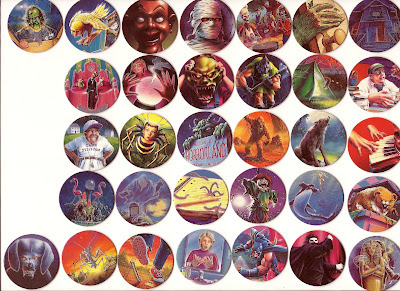 Do you remember your first Goosebumps book? I do, it was a choose your own adventure [Give Yourself Goosebumps] book Knight in Screaming Armor. It was a holographic cover and it was my first Goosebumps book. I remember watching it everyday on PBS after school. RL Stine himself interacted with you in regard to the rave on Twitter. How was that experience? Yeah! I had tweeted him earlier in the year because I had been looking for a Goosebumps shirts and asked him where I could get one. He tweeted me back and said I should try time-traveling back to the 90s. When I thought of [the rave] I thought I should tell him, he lives in New York, maybe he’ll see it. I didn’t think anything would come of it even though he’s pretty active on Twitter. And then he did and I couldn’t believe it. I actually got a notification from a friend and she told me RL Stine retweeted me and sent me a screenshot. That was really awesome. He’s definitely a childhood hero of mine. So, each week is going to be based on a different book? Yes, that was Frankie of Sandlot / DUGOUT Ent. who put booked the talent and venue’s idea. This week is Welcome to the Dead House. Next Friday,, October 11th, will be Stay Out of the Basement with Sandlot and Rumble Filthskin. October 18th is Monster Blood, complete with slime, and October 25th is Calling All Creeps.